In the past two decades, Brisbane has experienced the millennium drought (1995 – 2009) and two significant floods (2011 and 2013), and as a subtropical city it is also affected by frequent and severe storms. These experiences have driven Brisbane to adapt, recover and thrive in the face of these climatic events. Brisbane City Council is working closely with local stakeholders to achieve a vision of a clean and green city, increasing the use of natural assets and implementing adaptation measures for flood and sea level rise. The floods and droughts in Brisbane have highlighted the importance of managing water at all stages of the water cycle and have reshaped Brisbane’s relationship with water. With community education strategies and sharpened government policies on water conservation, recycling, and reuse, Brisbane has become a city of water savers. One significant success story is that Brisbane residents reduced their water consumption from 300 to 127 litres per day during the Millennium Drought (Brisbane’s Total Water Cycle Management Plan). Do you want to know more about Brisbane's Water-Wise Story? Floods, droughts & variable climatic conditions. Primary water supply from Wivenhoe Dam, 70km northwest of CBD. Brisbane City Council is working closely with local stakeholders to achieve a vision of a clean and green city, increasing the use of natural assets and implementing adaptation measures for flood and sea level rise. Brisbane has come a long way on the water wise journey. From a small outpost that struggled to provide its residents with clean drinking water during the early 1800s, Brisbane has become a sophisticated city that manages water at all stages of the water cycle and is known for its leading edge management of water in flood and drought. 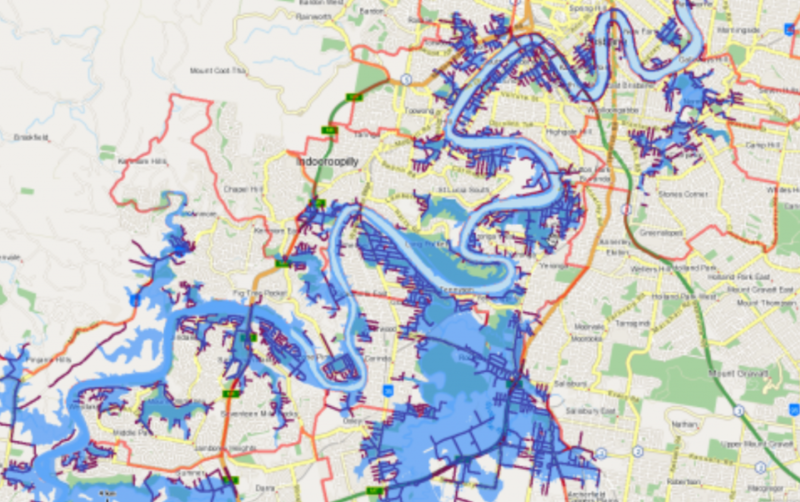 Water defines Brisbane as a river city. It provides a sense of place through 4,000 kilometres of waterways; that supports the population, biodiversity and extensive natural areas. Brisbane is renowned for its riverside location, subtropical climate and friendly relaxed lifestyle – all of which attract businesses, workers, students and tourists from across the world. Brisbane City Council’s long term vision is for Brisbane to be one of the cleanest and greenest of the world’s capital cities. That, “our subtropical open spaces and natural areas provide breathing spaces for the city” and “our river, creeks and bay are enhanced, protected and enjoyed by all.” Find out more about what your council and you can do towards the Brisbane Vision 2031. Integrated management of world class natural resources is an essential approach for a resilient and liveable city like Brisbane. Regional collaboration is the hallmark of Brisbane’s sustainable urban water story. Brisbane City Council works in partnership with multiple stakeholders to ensure secure, healthy and sustainable water resources. These partners include Queensland Government, neighbouring local councils, community groups, businesses, industries and many others. Brisbane also partners and supports its globally recognised research institutes and programs, bringing opportunities to the city to implement tailored and leading-edge water solutions. The CRC Water Sensitive Cities, the Australian Rivers Institute, the Advanced Water Management Centre, the International River Foundation and Healthy Waterways all of which are based in Brisbane and all contribute significantly to developing water knowledge and capacity in the region and all influence the global water conversation. Urban planners and water professionals have collaborated to create areas that handle flood risk. This has resulted in increased urban green spaces, amenity and overall liveability for the community, such as the Norman Creek Master Plan described in the case study below. The Norman Creek catchment is one of the city’s most urbanised places, separated from the CBD only by the Brisbane River. 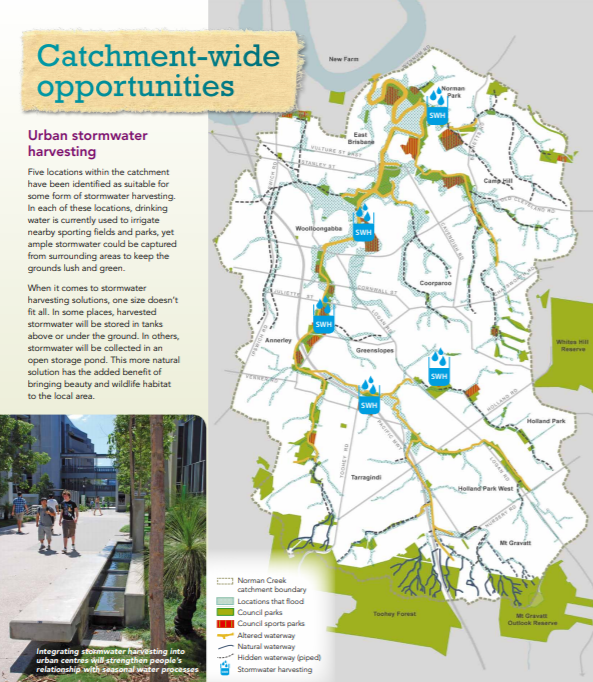 Council’s Norman Creek 2012-2031 Master Plan acknowledges the rich urban fabric of the catchment. This is achieved by providing new opportunities to bring nature back into the area by re-establishing natural processes and reconnecting communities with their waterways. The Master Plan is not just about rejuvenating local waterways, but also about achieving multiple outcomes for the city, from strengthening the economy; to improving access and inclusion for all residents, all of which is based on the one principle; designing with water in mind. •	Focus on water quality for ecosystem improvement and protection. •	Multiple rehabilitation works along our waterways and open water bodies to support long term water body improvements. •	Mapping of groundwater dependent ecosystems in 2014 to better understand where surface water replenishes aquifers. •	Water saving campaigns initiated over 10 years ago has resulted in sustained water savings (up to 130 litres/person/day). •	New approaches to fit-for-purpose water supplies delivered. •	In 2008, a storm water harvesting program commenced. •	90,000 rainwater tanks provided to residents via a rebate process from 2005-2008. •	Integrated regional and local planning to ensure water supply and treatment infrastructure is sequenced with new developments. •	A restructured regional water governance model from water collection to water delivery. •	New networks for flood mitigation engaged post 2011 flood, including back flow devices, drainage upgrades, removal of at risk properties and better communication allowing customers to make informed property acquisition choices. •	Regional interconnected network of water storages, water treatment plants and distribution lines since 2008, has provided resilience to changes and shocks to any one part of the system. •	Changes to planning provisions support flexibility in reducing flood impact on urban spaces, business, and residences. •	Specifically designed urban spaces created to support both community and flooding values that reflect the principle of ’designing with water in mind’. •	Water as a major focus with fountains emerging through the city. •	New projects providing access for the community to enjoy water including new planning and strategy development (Rivers Edge Strategy) and public infrastructure - Riverwalk. •	Brisbane is now part of the new South-East Queensland water grid which allows transfer of water across water catchments. •	Initiated a $15 million Stormwater Harvesting Program that now provides 400ML of water each year for sports field irrigation. •	Investment in Healthy Waterways and Catchment Program to reduce sediment load and litter to our waterways. •	Party to the Resilient Rivers Initiative to support catchment-wide waterway repair. •	Delivered Council’s Creek Filtration Systems to support cleaner waterways. •	Planning provisions that support hazard based planning and resident decision making. •	Major investment in rebuilding flood resistant infrastructure after 2011 floods eg, purpose built ferry terminals.  •	Creation of Disaster Management Office to coordinate activity during, and post, extreme events. •	Twenty year involvement with catchment group participation and action to improve the health of waterways. •	Community engaged in catchment vision setting and master planning. •	Multidisciplinary virtual teams created as needed to deliver complex projects such as the Norman Creek Masterplan. •	Council has been a partner and a proud supporter of the Cooperative Research Centre (CRC) for Water Sensitive Cities since 2014. •	The development of a regional water distribution and retail utility with ability to deliver integrated network planning. •	WaterSmart Strategy and Total Water Cycle Management Plan providing commitment to integrated water policy and planning. •	Policy makers seek integrated policy outcomes across the water agenda. •	Motivate to seek integrated outcomes for the City based on strong policy platforms of water sustainability, flood management, healthy waterways and water communication. •	Invest in the development of water knowledge and seek new approaches to long standing water issues. Brisbane 2031- Brisbane is a Clean and Green City. This vision of the city is backed by Brisbane’s WaterSmart Strategy, Total Water Cycle Management Plan and FloodSmart Future Strategy. These strategies all aim to integrate decision making and support the resilience of the City to the challenges of managing water in a subtropical landscape. 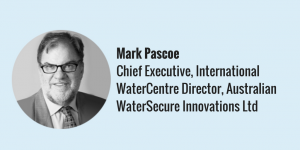 With intense summer rainfall that can lead to significant flooding and water quality issues, policy and project integration is essential in achieving solutions for Brisbane. Having a strong governance model is essential to achieving the water vision for the City. Working with all parties and stakeholders across the City allows Brisbane to refine policy and delivery models.  Collaboration and communication is the key to ensuring the regional governance model operates effectively. With many significant parties to the water governance model for the City, open communication and transparency between all parties is essential. The CRC Water Sensitive Cities, the Australian Rivers Institute, the Advanced Water Management Centre, the International River Foundation and Healthy Waterways all of which are based in Brisbane and all contribute significantly to developing water knowledge and capacity in the region and all influence the global water conversation. As tertiary education is one of Brisbane’s largest exports, Brisbane is a host to a range of globally recognised research institutes and partnerships. Coordinated planning in South East Queensland provides the structure for Brisbane to develop integrated and innovative planning outcomes. The SEQ Regional Plan sets regional outcomes and dwelling targets and expresses the regional interest of the Queensland Government and allows these to be expressed by the City. Flood smart planning provisions and initiatives support the development of a future city that is resilient to flood risks and protects our waterways to support biodiversity and stormwater flows. Brisbane’s Total Water Cycle Management Plan and Queensland Urban Utility’s Netserv Plan seeks to coordinate the interactions between programs, outcomes with on-ground activities while being supported by good communication. Council’s annual budget has identified almost $80 million to be invested in water or water related projects across the City during 2016/17. Council has committed to revitalising the run-down Oxley Creek catchment into a 600 hectare world class green corridor and leisure landmark which is now a reality with a commitment of $15 million over the next four years. Council’s New World City Image and slogan of “Come for the Job and Stay for the Lifestyle” required effective planning tools to support economic development and attractive open spaces for our community to enjoy.